It’s week 17 of our CSA – only 1 more week left! Some years we are almost out of vegetables by now and the boxes reflect this. But this year we are still picking a lot of stuff! In fact, there are 5 new vegetables in the share this week! We’re pretty excited about that. Carrots, corn, squash, shallots, baby kale, peppers, arugula, lettuce, garlic. 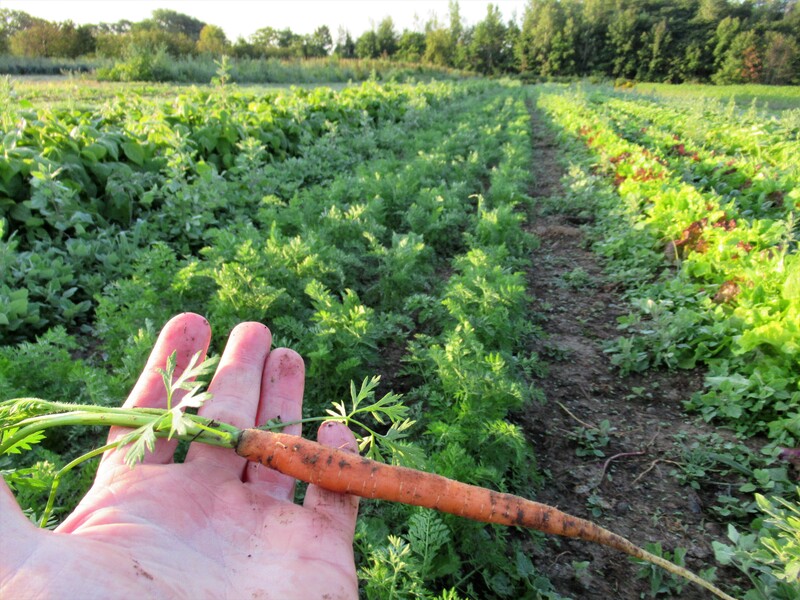 Carrots are not something usually found in our CSA box. We have not grown them in years. But we tried them again this season – and they turned out great. And they taste even better! We grow 1 planting of corn each year. This season we got it in quite late and weren’t sure it would mature in time. But it has! Enjoy some fresh corn-on-the-cob in your share this week. I’ll give the same warning I do each year – the corn is not sprayed so don’t be surprised if you find a few worms. In the past, most CSA members have said they prefer to cut out a worm or 2, rather than have insecticide on their corn. Please give us your opinion on this. We began to cut the squash today and pile it up in the field to cure. It felt wrong to be harvesting a fall vegetable in such hot & humid conditions (high 30’s C.). 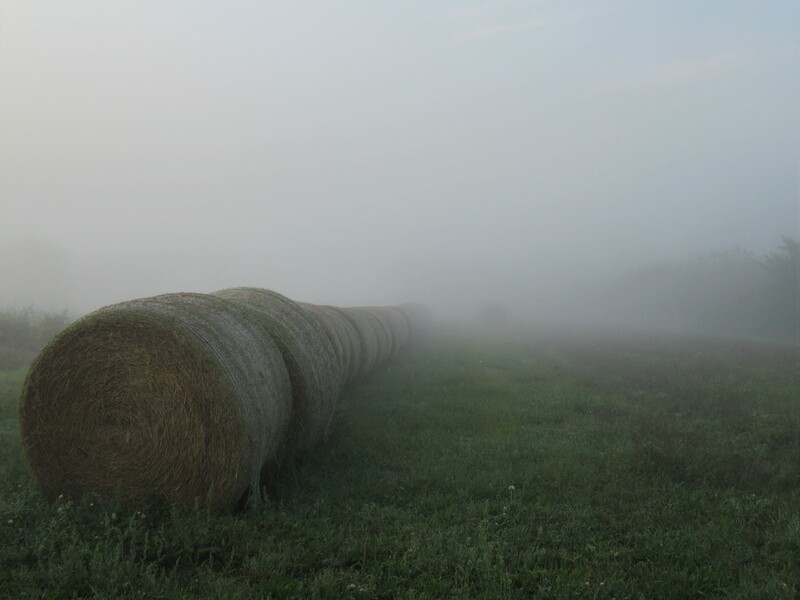 It also felt wrong – or at least disappointing – to have such a poor harvest. 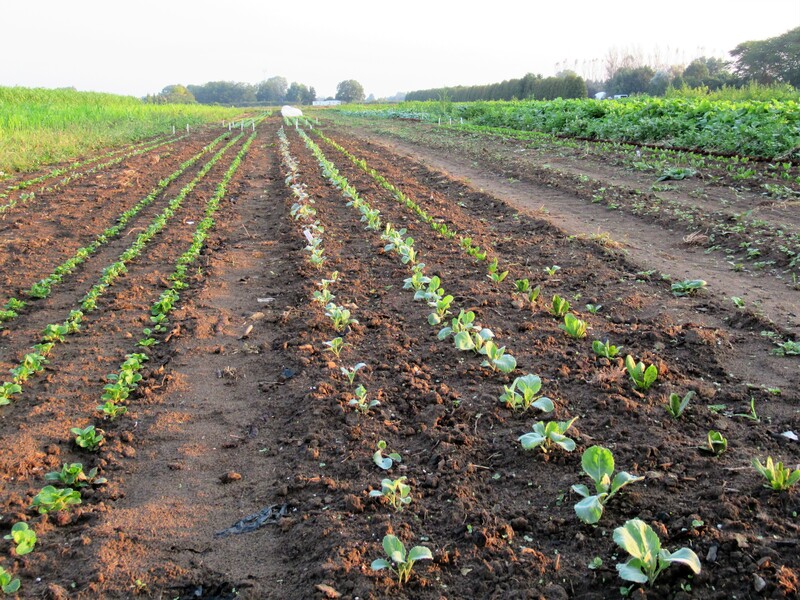 We planted 27 varieties but picked only about a dozen kinds, and very few squash in total. Butternut squash is one that turned out ok. It is also one of the more popular kinds. 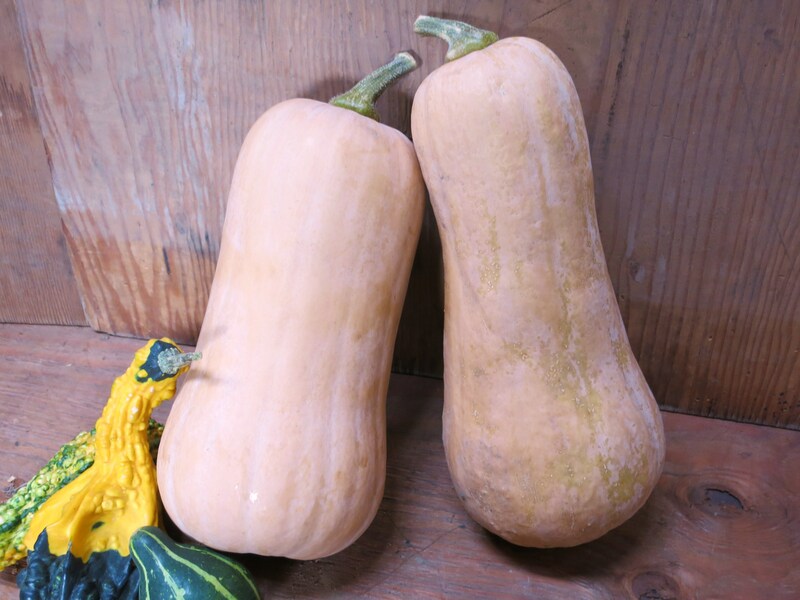 It is a delicious squash with a thick, orange flesh, somewhat sweet and nutty. It is very versatile and can be used for roasting, stews & casseroles, and baking (pies, muffins, bread …). Instead of onions there will be shallots in your box this week. Shallots are similar to an onion but perhaps less pungent & a little sweeter, with a hint of garlic. This makes them excellent to use raw, perhaps in salads or dressings. When cooking with shallots, you will notice a finer, smoother texture well suited to sauces, quiches & custards. 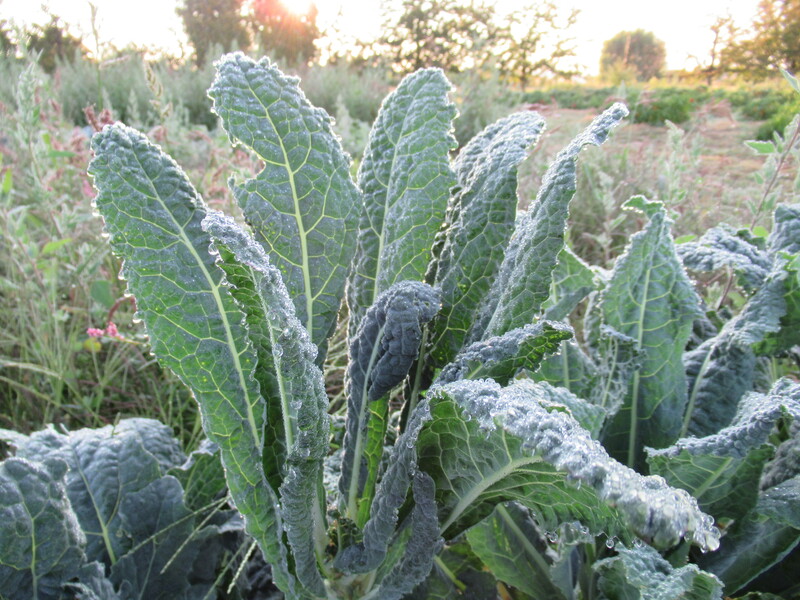 Baby kale – small leaves & stems that are especially great raw, in salads. 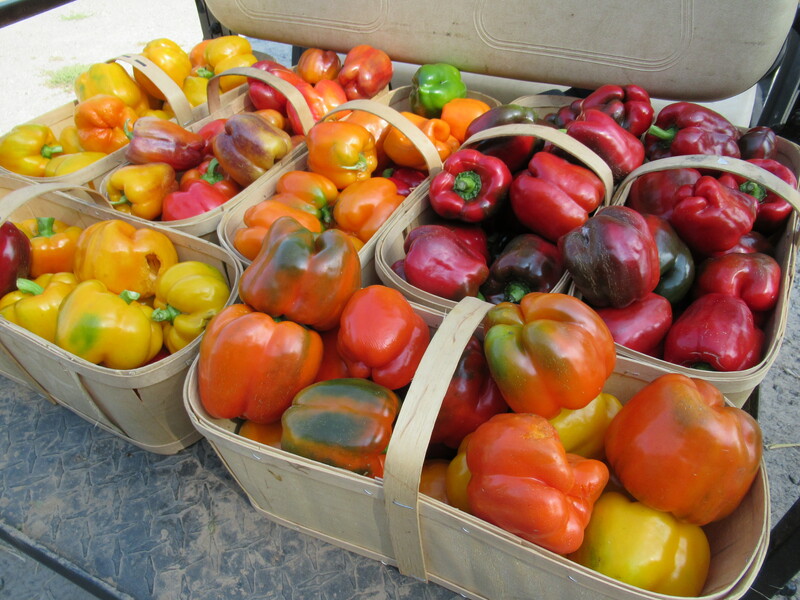 There will be both bell peppers & shepherd peppers available again this week. The bells come in more colours, the shepherds only in red. You will notice that many of our peppers are not completely coloured – there is often some green along with the red, yellow or orange. It seems we are not the only ones who enjoy sweet peppers. 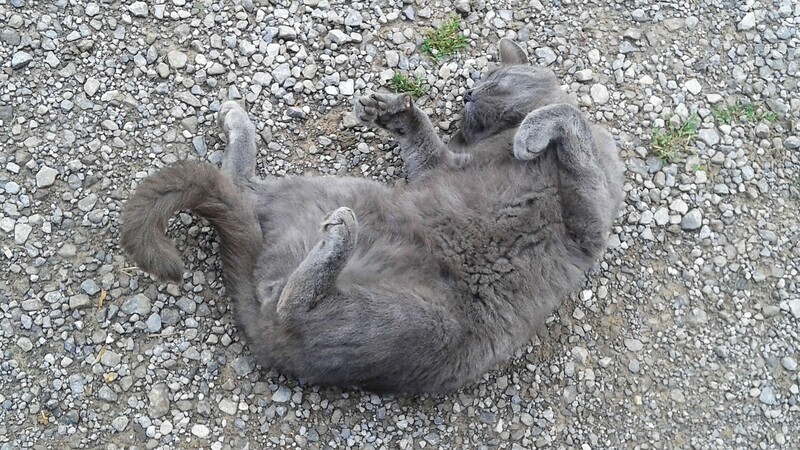 Mice (and maybe rabbits too) find them tasty! 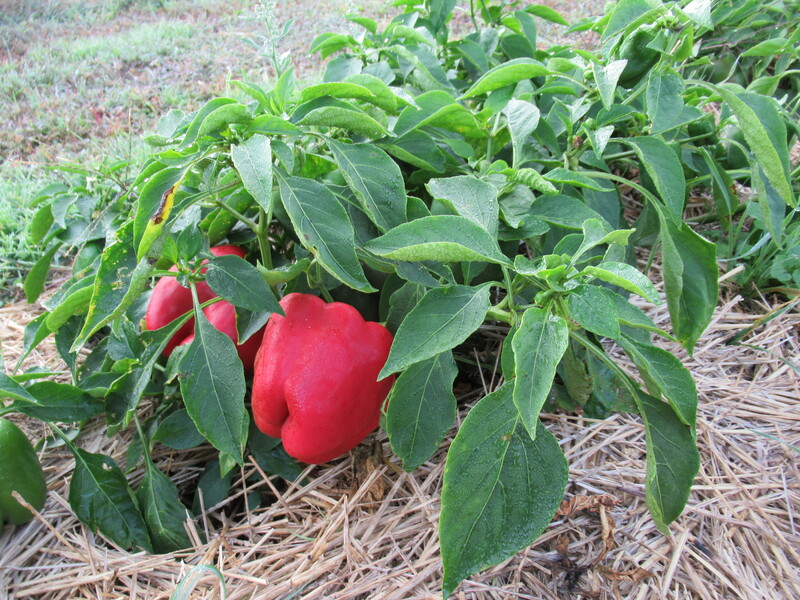 If we leave the peppers on the plant to completely turn colour, they are very often chewed & eaten. 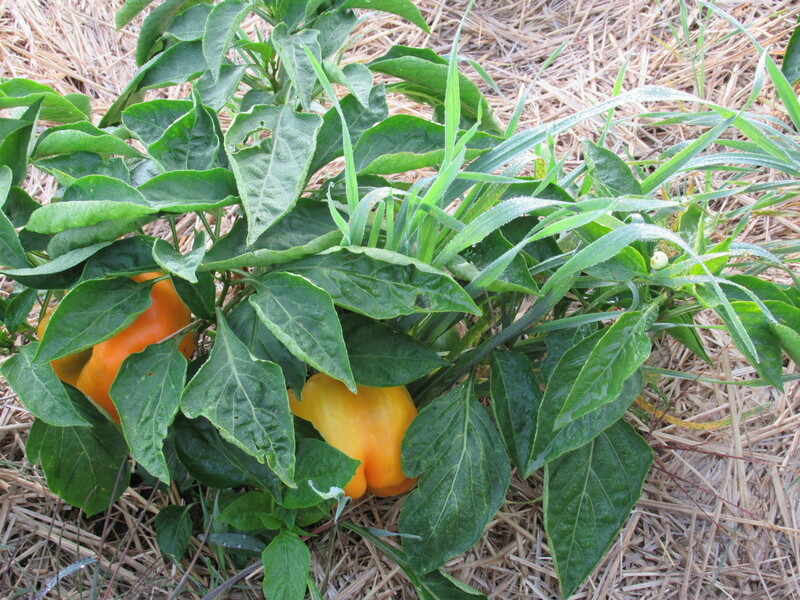 As it is we are losing probably a third of our peppers to critters & spoilage. Both peppers taste great but shepherd peppers are a bit sweeter and have a thicker flesh making them the better choice for roasting. Arugula, lettuce & garlic round out the CSA basket this week. Remember – next week is our last week for CSA! Spinach, bok choy, lettuce, beans, zucchini, peppers, onions, garlic, (maybe tomatoes). 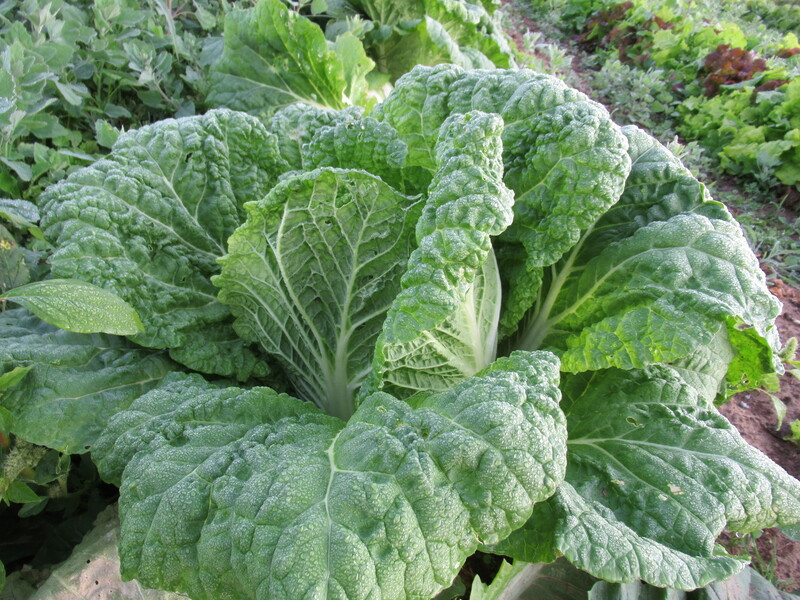 There are 3 kinds of greens in the box this week – spinach, bok choy & lettuce. That’s a lot of green! But they are all ready, & beautiful, & delicious, and we couldn’t decide which one to leave out – so we included them all. 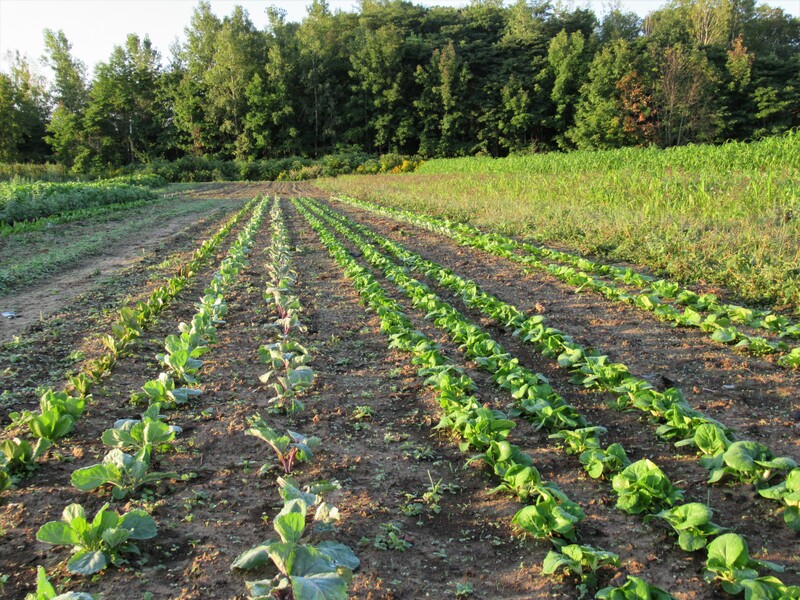 Bok choy seems to be a little unfamiliar to some of our CSA members. It is best stir-fried either on it’s own or with other vegetables. 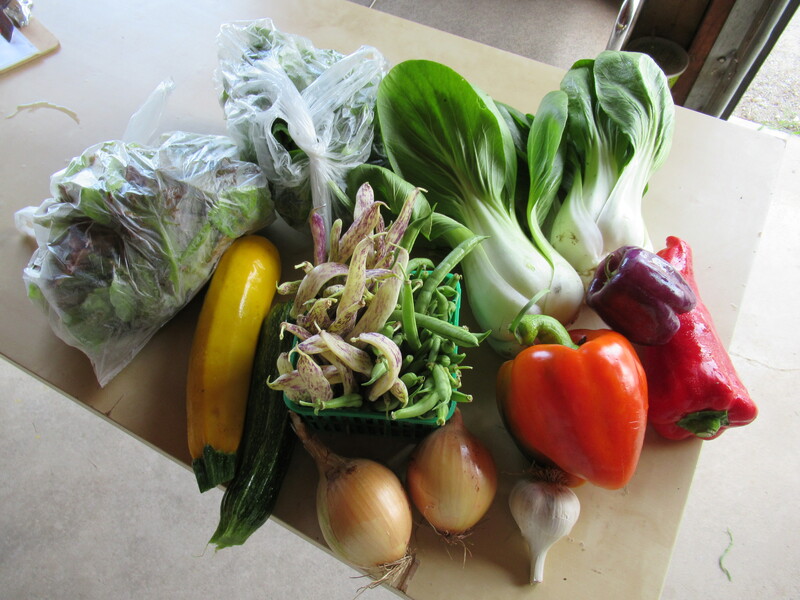 Actually, the box this week has all the makings for an amazing stir-fry – bok choy, beans, zucchini, peppers, onions & garlic. Save the lettuce, spinach & tomatoes for a salad. combine all ingredients and pour over stir-fried vegetables. Heat through till sauce thickens. 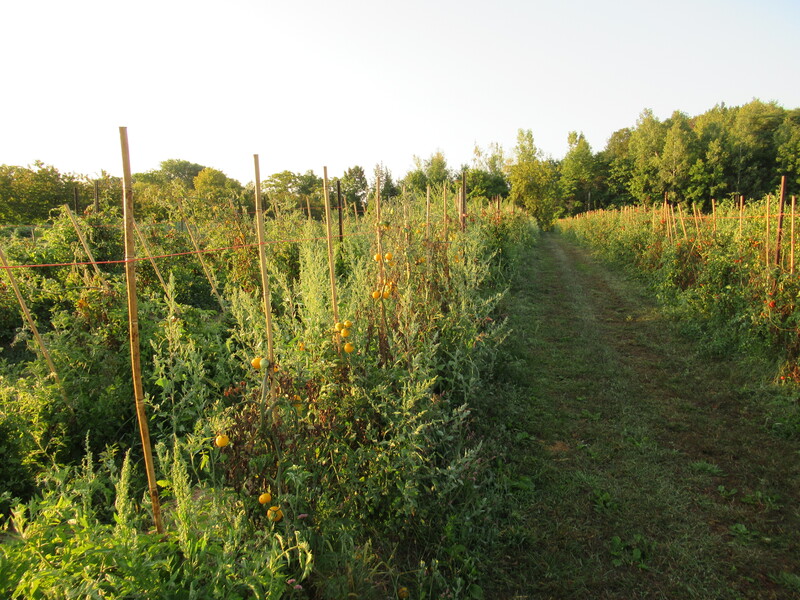 There are 2 weeks left in our CSA. 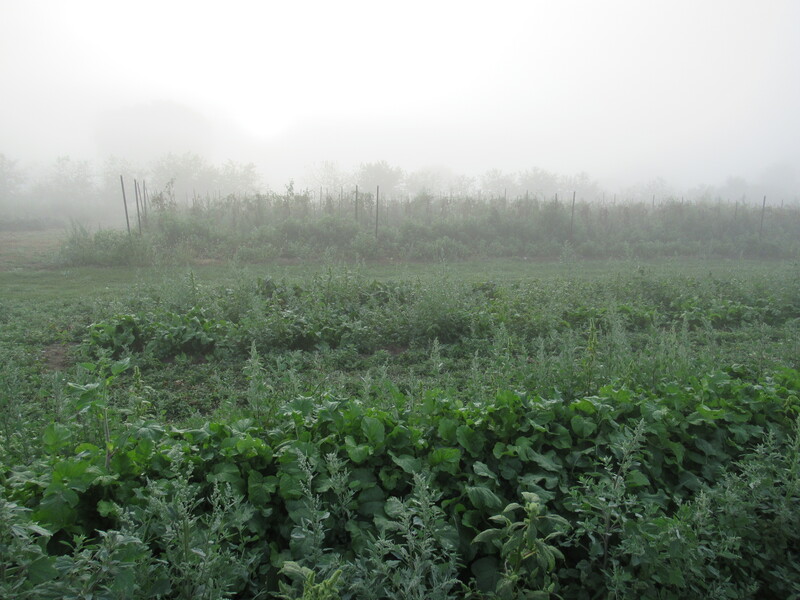 The dew is often heavy & lingering, which means a slower start to picking – for our sake, but mostly for the vegetables. 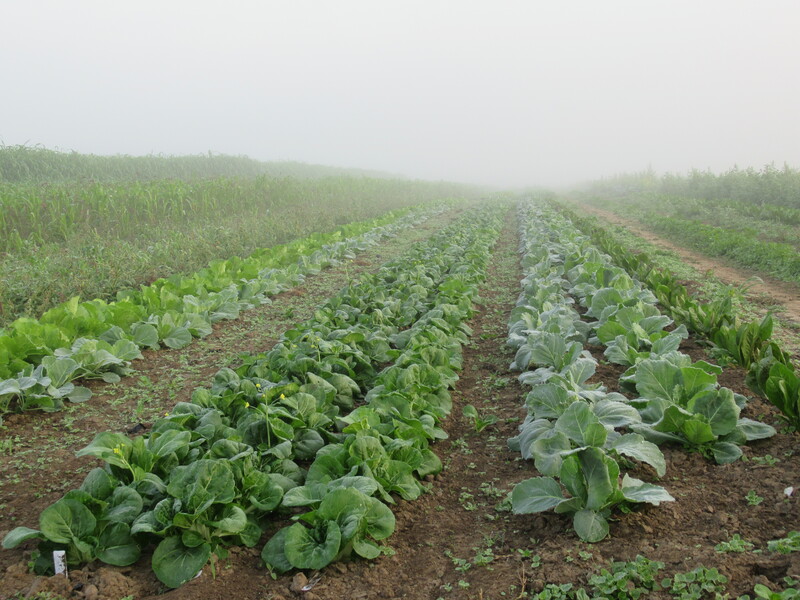 Picking vegetables wet can lead to disease on the plants (eg. beans get rust), or mold & spoilage issues with the fruit (eg. blackberries). 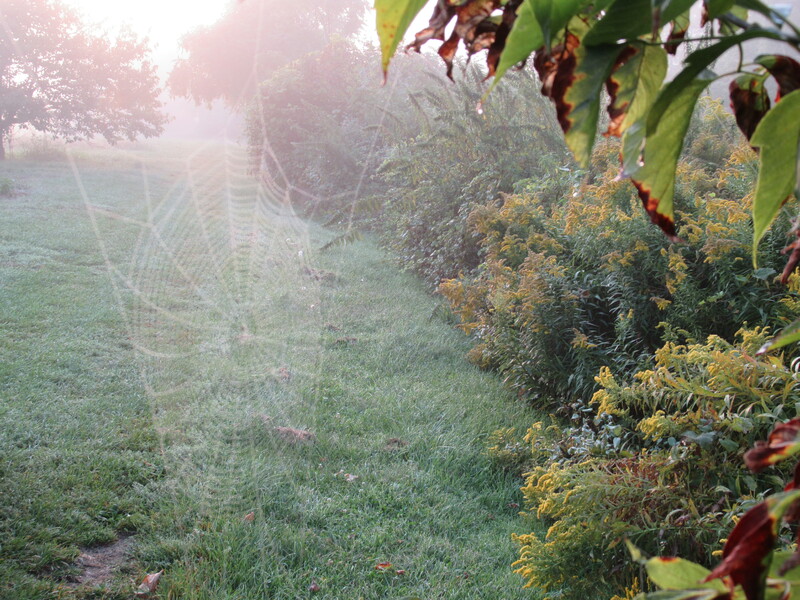 But the morning dew & the bright sunshine are also beautiful! the end of the summer vegetables … and blackberries. 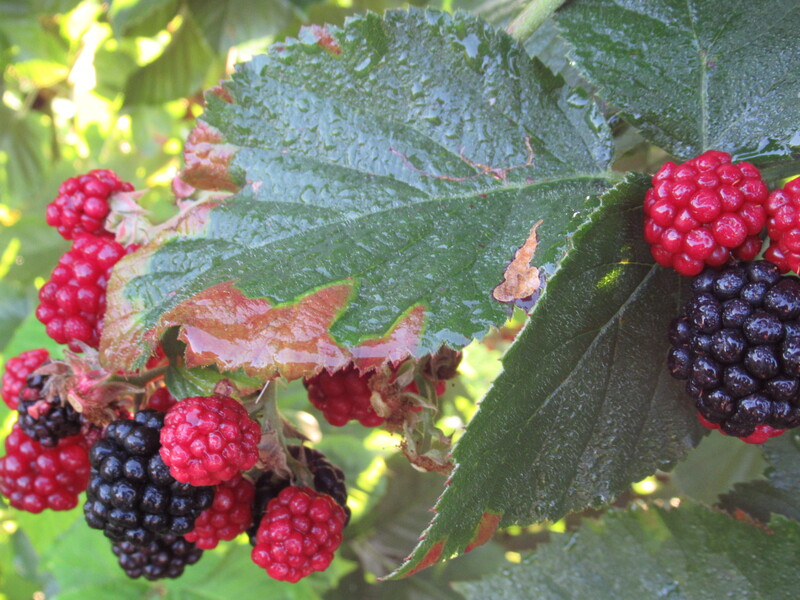 Many blackberry plants are almost picked clean, while others still have quite a few berries. the end of seeding & planting. 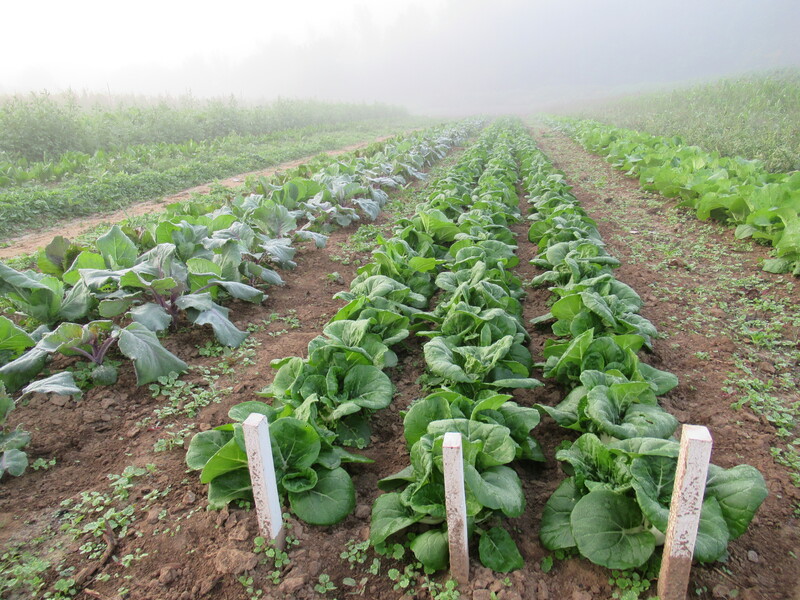 This week we will seed our final crops – lettuce, spinach, arugula, and kale and transplant the last of the cabbages & other lettuces. Chinese cabbage, beets, peppers, beans or zucchini, blackberries, lettuce, tomatoes, onions, garlic. 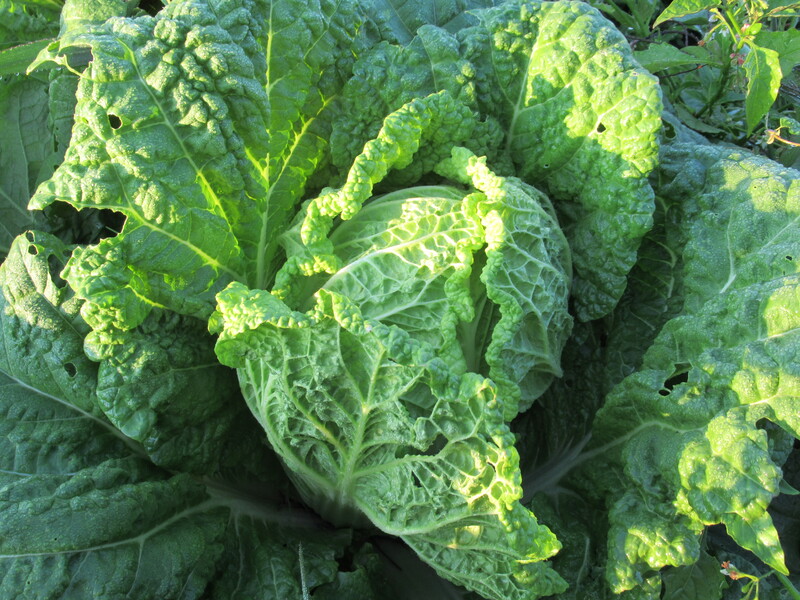 Chinese cabbage is different from our regular cabbage. It is tender, mild & sweet. Enjoy it raw in salads, or in stir-fries or steamed. Because it is so tender it cooks quickly & can turn to mush if overdone! 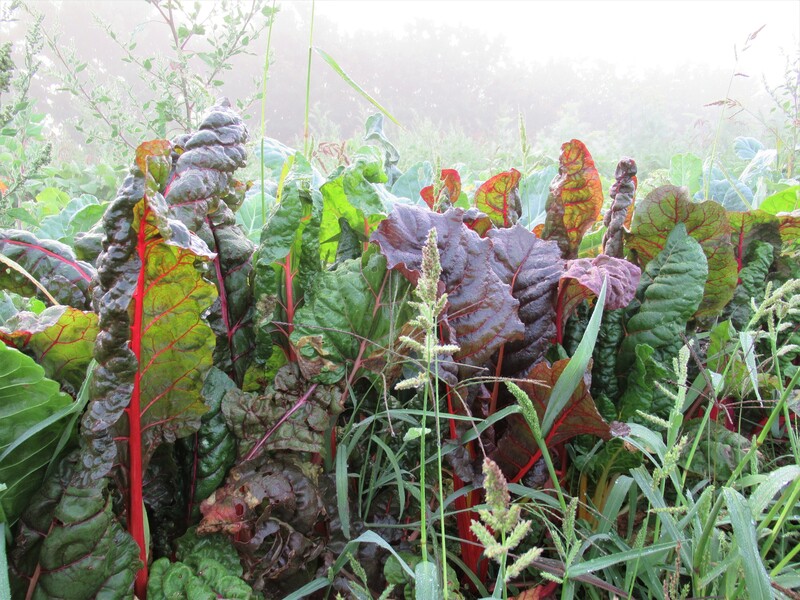 Our new patch of beets includes red beets, yellow beets & candy cane – red & white striped – beets. They are all delicious & sweet! 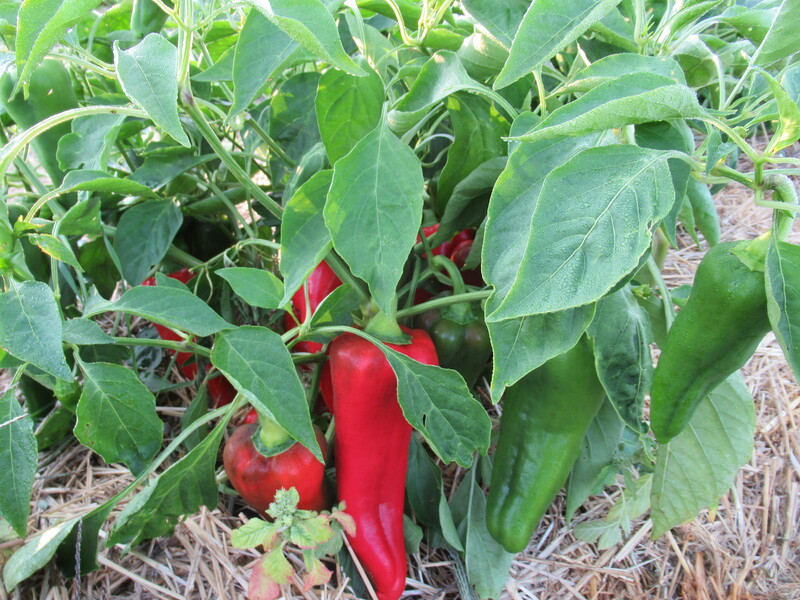 When we go through the pepper patch now, we can finally see lots of colour – and lots of peppers. 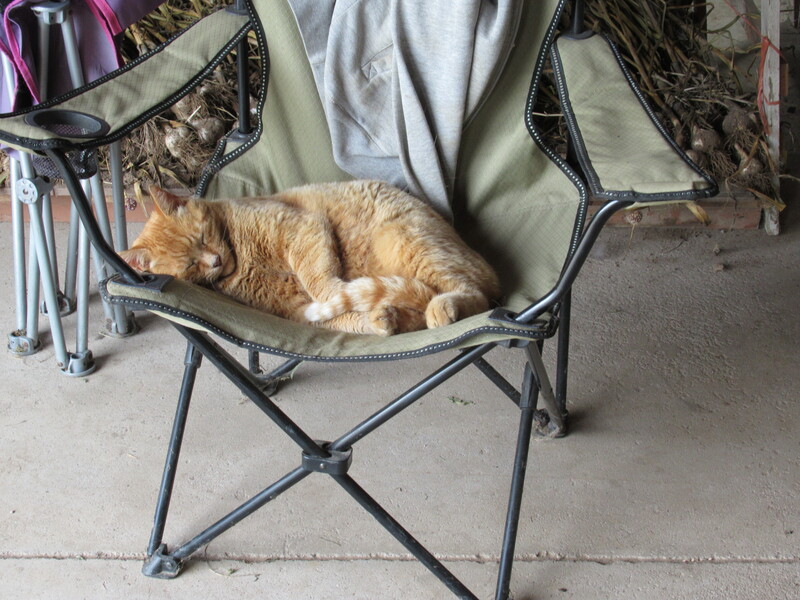 The forecasted warmth this week should bring them on faster. They are both beautiful & delicious! Beans & zucchini – we have both, but not a lot of either. Choose one or the other this week. 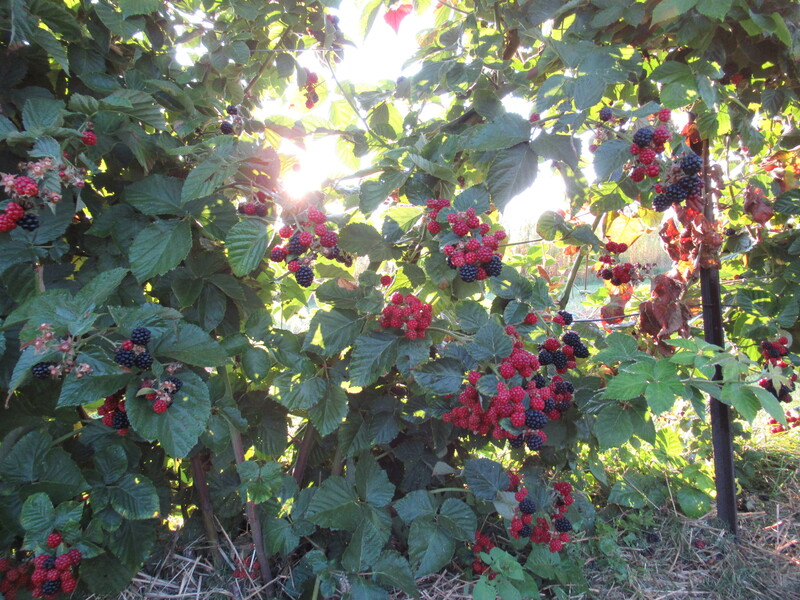 Enjoy the blackberries this week – perhaps the final week for them! 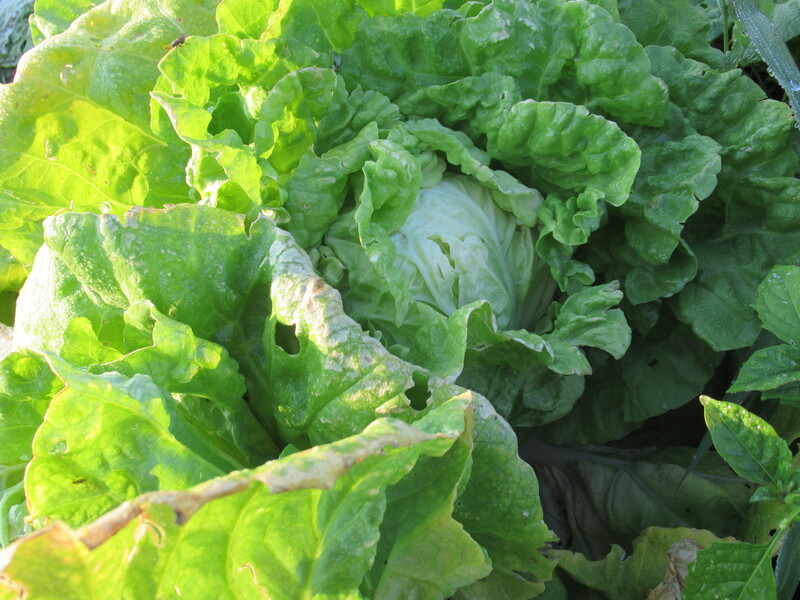 Lettuce, tomatoes, onions & garlic – part of your CSA share again this week. 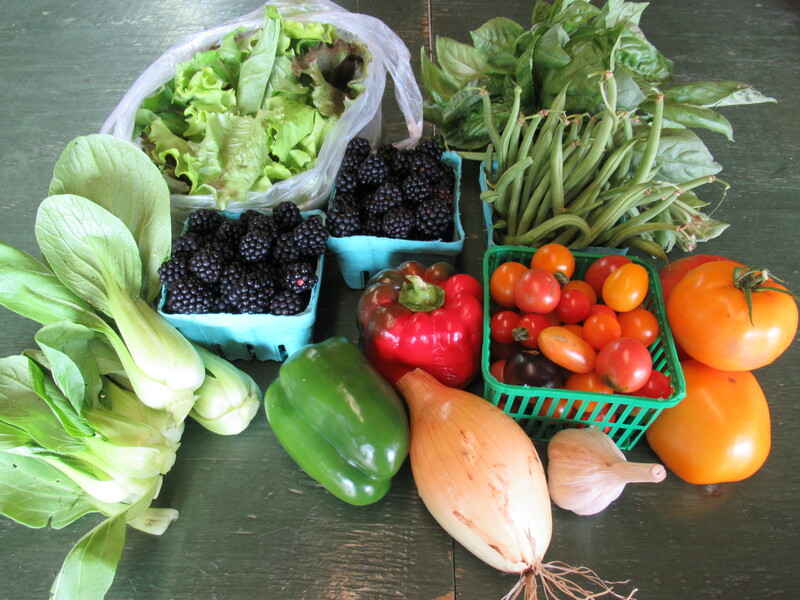 This is week 15 of our CSA – 3 more weeks to go! 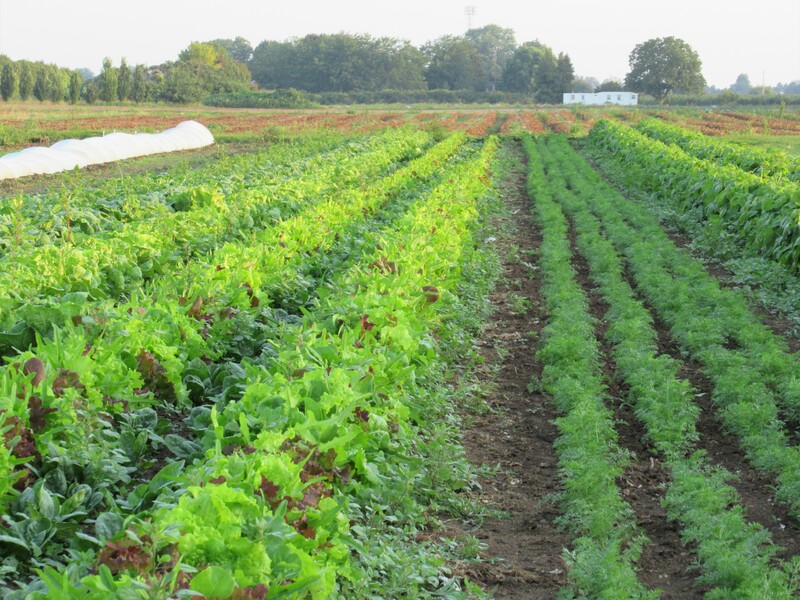 Providing fresh, local, quality produce at a fair price is one of the primary goals of CSA. 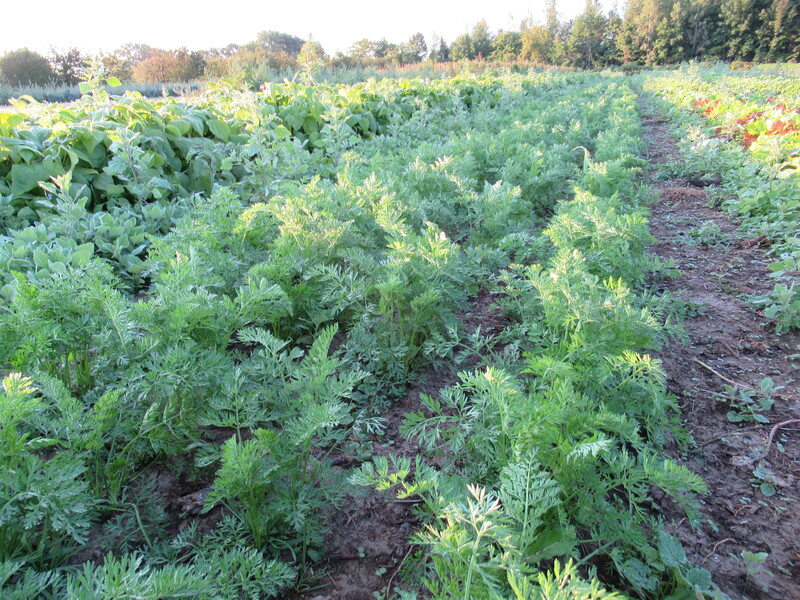 Along with that is the confidence in knowing where, how and who grows your food. Often, it seems that our youngest CSA members catch on to this the best – and take it to heart. 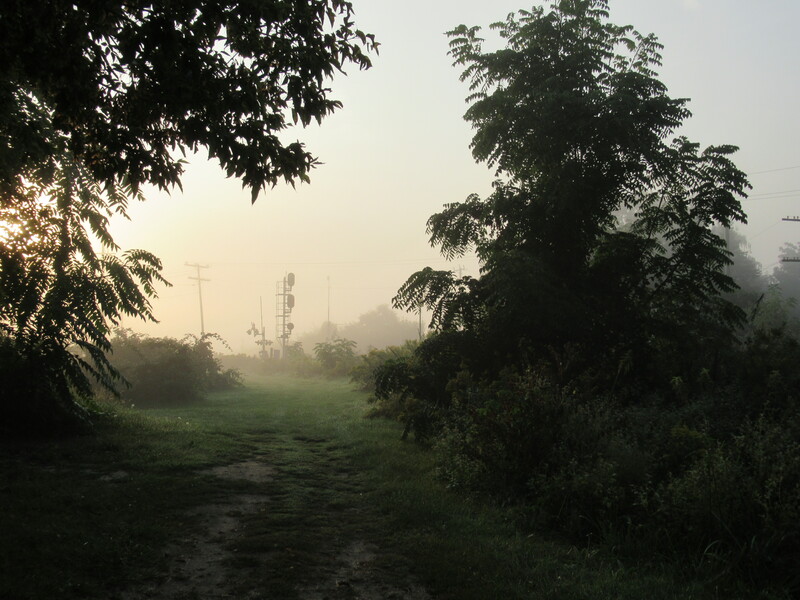 Here’s a story from a CSA member. Thanks Olivia! That’s the encouragement we needed! Cabbage, beans, bok choy, blackberries, peppers, tomatoes, lettuce, onions. 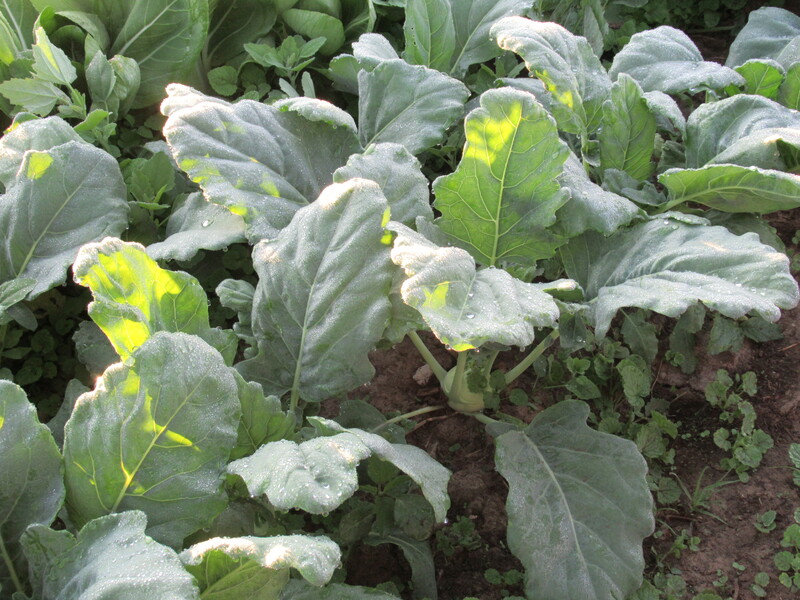 The first of the cabbage is ready for harvest! I’m a big fan of coleslaw so this is good news for me. 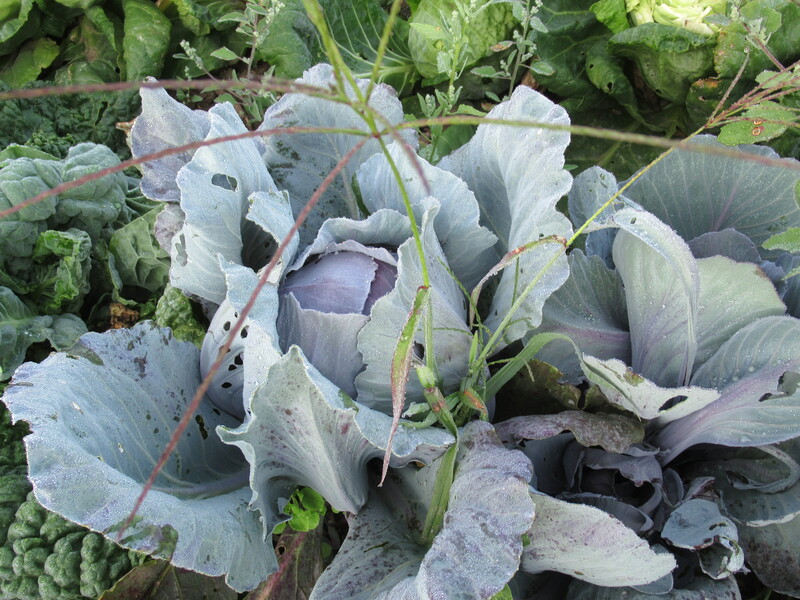 This weeks cabbage is green cabbage (red cabbage, Chinese cabbage, & savoy cabbage are still ahead). We grow varieties that give smaller heads, thinking that it’s better to finish a smaller cabbage sooner & get a fresh one next week, than eating from a huge head that takes up fridge space. I guess the weather is more to the bean plants liking now. We’re finally getting some serious bean harvests – green beans, and especially the purple striped dragon’s tongue. Treat them the same as a green bean – they just taste better! 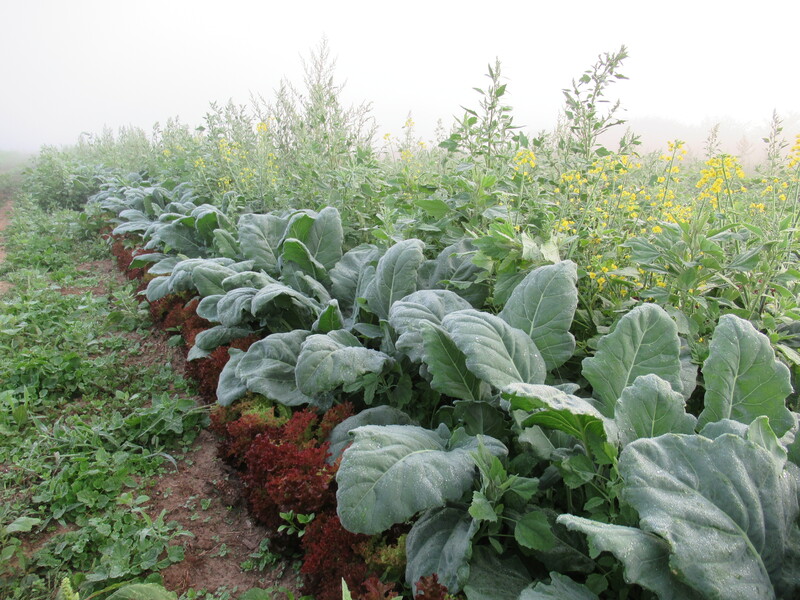 Perhaps we planted too much bok choy (some people here at Thiessen Farms think so)? It is plentiful now, as well as beautiful & delicious. Enjoy bok choy in your share again this week. 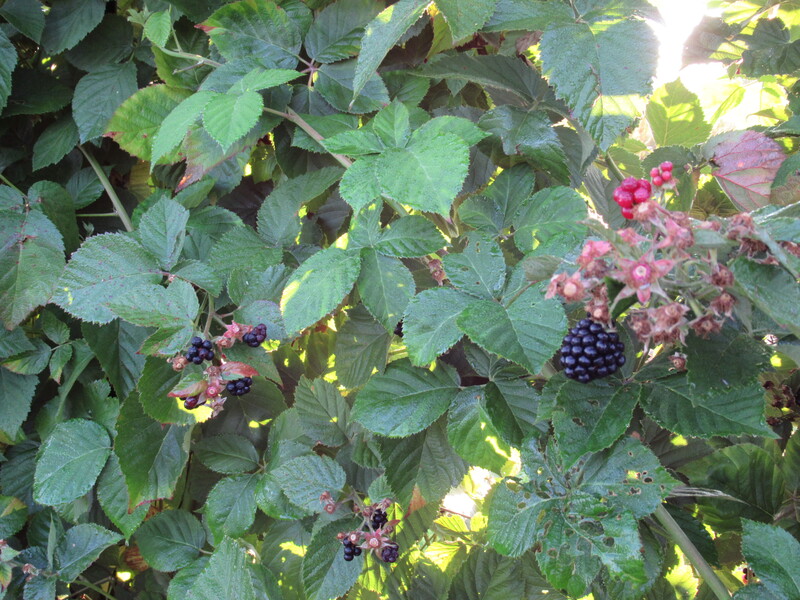 Our blackberry canes have given us a lot of blackberries this season. Many of the plants are empty now. Another week or so and blackberries will be finished. 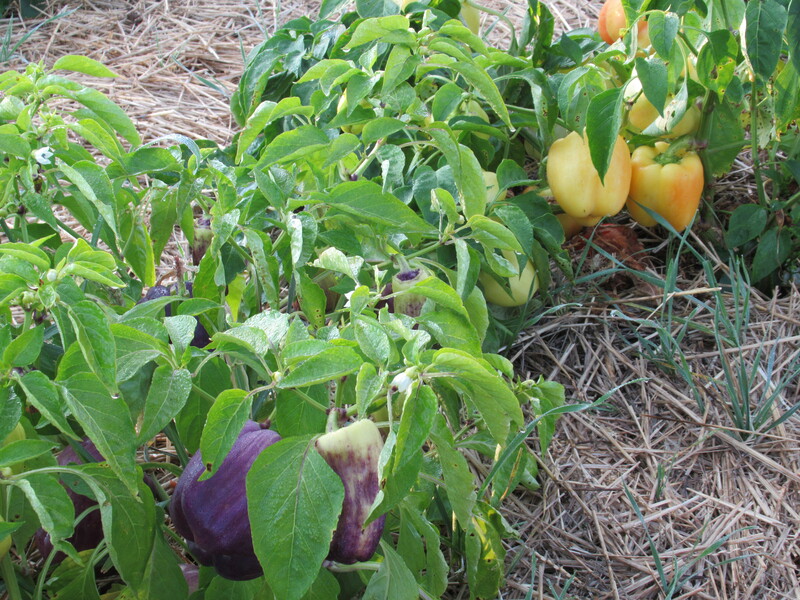 We’re seeing more colour appear on the sweet peppers – red, orange, yellow, & purple. 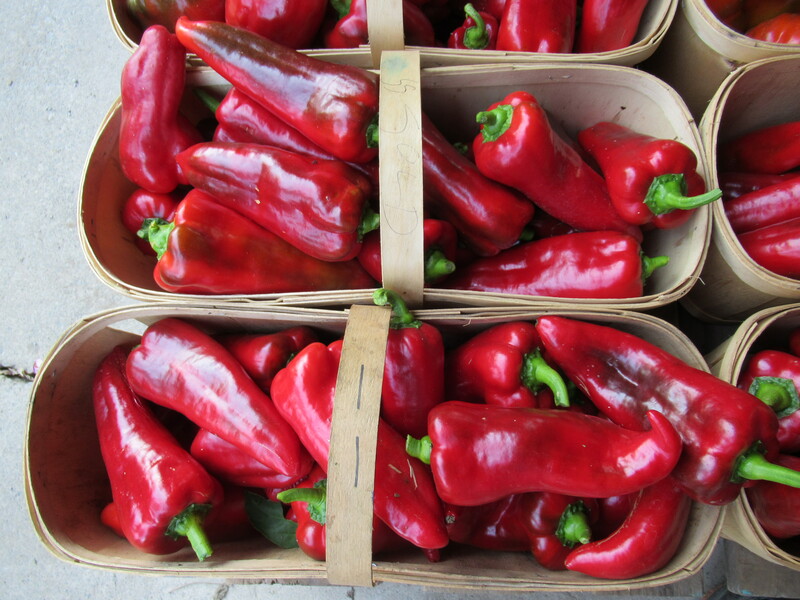 Peppers prefer warmer temperatures than we’ve experienced this summer, which is why they are slower & less prolific. The tomato patch is looking sadder & sadder. The plants have almost given up, yet still somehow manage to ripen some fruit. There are less cherry size tomatoes, and more of the larger beefsteak kinds now. 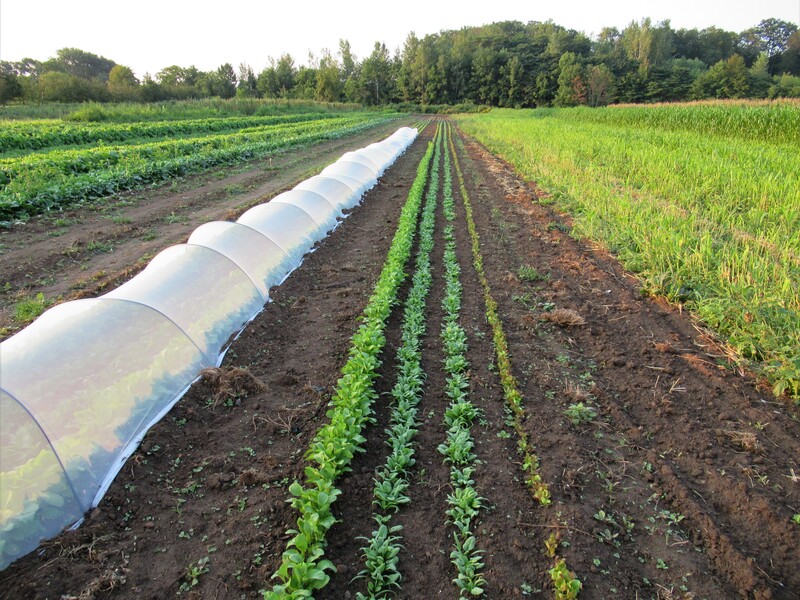 The cooler temperatures lately are perfect for growing lettuce. 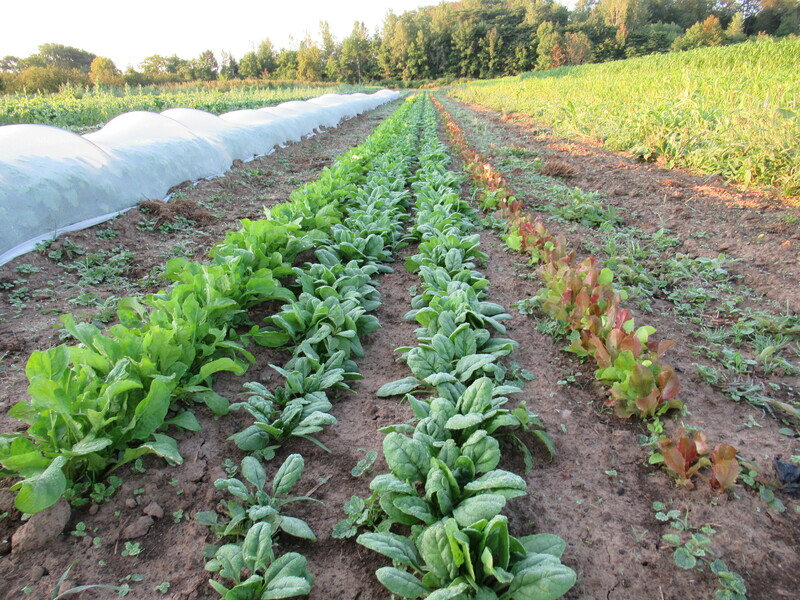 We keep planting more, so there should be lettuce for most of the CSA season! The onions are all picked now. No more green tops, and no more huge bulbs – but lots of smaller, delicious onions for another week or 2. Vegetable gratin recipes often have a crunchy breadcrumb or crouton topping. But summer tomatoes are too gorgeous to hide, so we tucked crusty cubes of bread underneath them instead. Plus, the bread soaks up all the juicy tomato goodness. If you can’t find marjoram, fresh basil or oregano makes a good substitute. Preheat oven to 400°F. Coat a 9-by-13-inch pan (or similar-size 3-quart baking dish) with cooking spray. Heat oil in a large skillet over medium heat. Add bread and cook, stirring occasionally, until brown and crispy, 6 to 8 minutes. Transfer the bread to a large bowl. Gently stir in cream, ¼ cup cheese, marjoram, garlic, vinegar, salt and pepper. Spread the mixture in the baking dish. Layer tomatoes on top and sprinkle with the remaining ¼ cup cheese. Bake the gratin until golden and crispy on top, 40 to 45 minutes. Garnish with marjoram, if desired.